I've heard of a Prince Rupert's drop - are Sundrops the same thing? I get this question all the time! The short answer is, "No, Sundrops aren't the same as Prince Rupert's drops." But that doesn't clarify things much, does it? So, to start off..
What is a Prince Rupert's drop? Prince Rupert's drops usually look like a curving tadpole, with a bulbous head and a long thin tail. If you've ever heard of Prince Rupert's Drops, you've probably heard that they are incredibly strong... unless you break the long skinny tail, at which point they shatter into a million pieces. How are Sundrops different than Prince Rupert's drops? Like Prince Rupert's drops, Sundrops also have a bulbous head and long thin tail - but are straight instead of curved. Sundrops are melted using a giant magnifying glass to focus sunlight to melt the glass. The "hot spot" created is only about 1cm in diameter, so only a small amount of glass can be melted at any time. While Prince Rupert's drops can range from an inch to a foot or more in length, depending on how much molten glass was used, the largest Sundrops I've ever made was less than 2" long. But the melting doesn't actually have anything to do with whether or not the molten glass becomes a Prince Rupert's drop. That is all in the cooling. So what's the difference? And why does a Prince Rupert's drop shatter? Sundrops melt, drip, and cool entirely in the air, and are small enough that the glass cools at a fairly consistent rate throughout the drop. Watch below to see a Sundrop melt, drip, and cool in the air. Within 10 seconds the thin tail is cool enough to touch and break the drop off. The rest of the drop will finish cooling in a small container. In contrast, a Prince Rupert's Drop is made by dripping molten glass into cold water. The cold water cools the outer part of the glass very quickly, while the inside remains molten. As the inner glass slowly cools, it contracts, creating a LOT of internal stress. 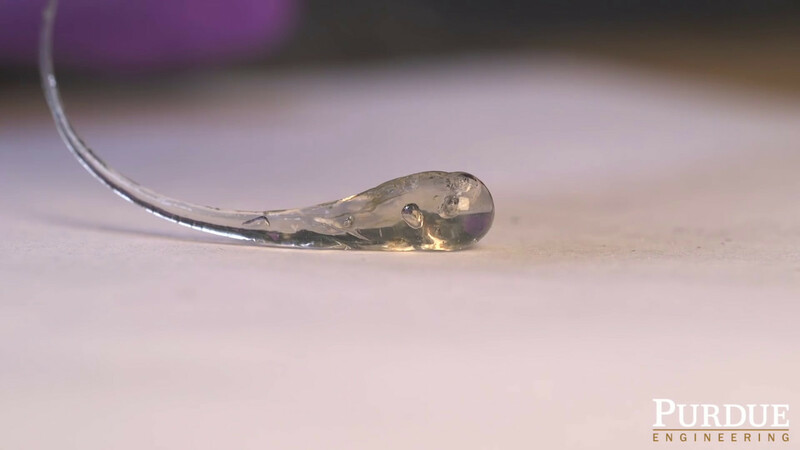 In an intact Prince Rupert's drop, that stress is balanced, creating a piece of glass that is much stronger than normal glass under most circumstances. But when you break the tail, the internal stresses release and immediately cause the entire Prince Rupert's drop to shatter. Want to see? Here's a Prince Rupert's drop being made... and then shattered. Because Sundrops cool gradually, they are not under these high conflicting stresses. I have NEVER had a Sundrop shatter like a Prince Rupert's drop - and I've made thousands of Sundrops over the last decade, out of all sorts of glass! Watch more videos of the Sundrop Jewelry glass-melting process. Prince Rupert's drops were actually the precursor to modern tempered glass, like that used in car windows. Tempered glass is created in such a way as to be under conflicting stresses (just like a Prince Rupert's drop), making it stronger than normal, yet when it does break, it crumbles into granular chunks instead of breaking into sharp shards like standard glass.